The class room at the Thornleigh Public School commemorates those who served in World War One. Thornleigh-Pennant Hills Memorial. An enthusiastic public meeting was held in the School of Arts, Thornleigh, on the 20th for the purpose of placing before the citizens a scheme for erecting a fitting memorial to those who enlisted from this district. Mr. G. Smith, president of the Thornleigh-Pennant Hills Parents and Citizens' Association, who presided, stressed the need for a fitting memento to the soldiers of the district and gave a resume of previous activities leading up to the appeal, stating that the Government had offered to build a memorial class-room at the Thornleigh public school, provided £200 was subscribed locally, of which sum they had already raised £77. The following resolution, proposed by Mr. Tankard, seconded by Mr. O. McLean, was carried unanimously: "That a memorial class-room be erected at the Thornleigh public -school, and that we accept the offer of the Government to build this on the condition that we subscribe the sum of £200 towards the cost of erection." This (Saturday) afternoon promises to be an important one at Thornlelgh Public School. The memorial classroom will be officially opened, and the honor roll will be unveiled. The Minister for Education (Mr. A. Bruntnell) will perform the ceremonies and a large number of prominent people are expected to be present. 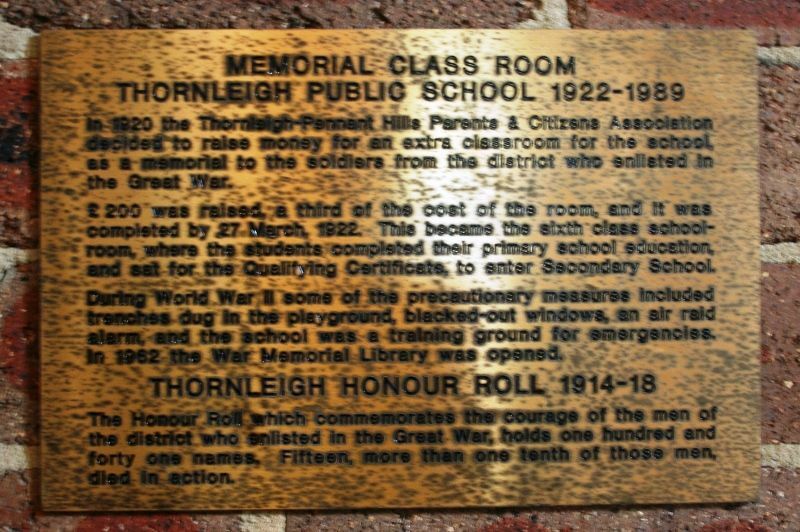 In 1920 Thornleigh Pennant Hills Parents and Citizens Association decided to raise money for an extra classroom and a memorial to the soldiers from the district who enlisted in The Great War. Two hundred Pounds was raised, a third of the cost of the room, and was completed on 22nd March 1922. This became the 6th classroom, where children were prepared for high school entry. During WW2, some of the precautionary measures included the darkening of windows, trench digging and an air raid alarm - the school was also a training ground for emergencies. In 1962 the war memorial library was opened. The Honour Roll which commemorates the courage of the men of the district who enlisted in the Great War, holds one hundred and forty one names. Fifteen, more than one tenth of those men, died in action.